Newspapers and websites around the world — or at least the part of the world that each year spends $9.9 billion on "personal development" — are telling us that only 8 percent of people who make New Year's resolutions succeed in meeting them. They tell us this every year and sometimes offer helpful tips on how we, too, can join that graceful 8 percent. In this way the self-help industry is self-perpetuating. What we're really trying to buy with those $9.9 billion every year, but failing to collect 92 percent of the time, is a measure of historical revision. We want to undo the 20 years' worth of cigarettes we smoked or erase the plaque in our arteries or otherwise make up for a lifetime of regrettable work, relationships or emotional decisions that delivered us into the arms of an existential crisis on Christmas morning when we unwrapped a copy of You Are a Badass and realized that we were not, by dint of receiving the book, a badass. We're seeking evidence that future events are not assured, but also that we can direct their trajectory. George Bailey gets to live his "wonderful life" not only again but better, and even Scrooge side-steps the Ghost of Christmas Future. These are fundamentally historical ideas, taught in graduate school as "contingency" and "agency," which show us how and why things do or do not change over time. Read hundreds of history books and you'll end up adding shades of nuance to a raft of clichés: "Nothing gets better until it gets worse"; "There's nothing new under the sun"; "Those who don't know history are doomed to repeat it." Admittedly, it's hard to maintain hope when you look too closely at history — even our own personal histories can seem desperately depressing when we get too "mindful" of them, as the self-help books suggest we do. Yet, there is a lot of contingency and agency in the world right now. 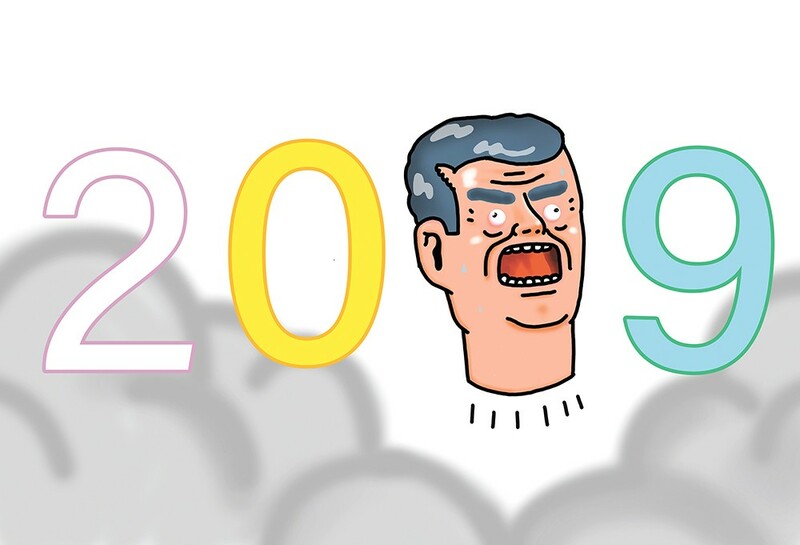 Despite my aversion to New Year's predictions, I have no doubt that 2019 will bring some historic changes. The tendency is to look to the past as prelude and shrug, "The more things change, the more they stay the same," but people are pissed these days. That's a big deal. The January/February edition of the Atlantic magazine carries an interesting piece titled "The Real Roots of American Rage: The untold story of how anger became the dominant emotion in our politics and personal lives — and what we can do about it," by Charles Duhigg. The piece opens with a psychology professor named James Averill, who in 1977 questioned residents of a small town in Massachusetts about how often they were angry. He found most people were "mildly to moderately angry" a fair amount of the time, but not aimlessly so. Their anger was targeted at specific people in specific instances, and rather than suppressing it, they let it out in "short and restrained conversations." This wasn't necessarily a bad thing. According to Duhigg, "In the vast majority of cases, expressing anger resulted in all parties becoming more willing to listen, more inclined to speak honestly, more accommodating of each other's complaints. ... They felt relieved, more optimistic about the future, more energized." That sounds like the preferred outcome of a self-help book to me. Zach Hagadone is a former co-publisher/owner of the Sandpoint Reader, former editor of Boise Weekly and acurrent grad student at Washington State University. The original print version of this article was headlined "Let It All Out"